What things would you have loved to see in the Bond series that just didn't turn out the way you wanted? That's all I can think of off the top of my head-- what are yours? Agreed on these. Definitely more Dalton in '91; '93. 1. A proper follow up to DAF. 2. A GOOD DAD. that film had a lot going for it but everything was thrown away. 1. Casino Royale in '62. Frank Sinatra be ask again or he whant doing a title song. Michael Jackson doing a title song. 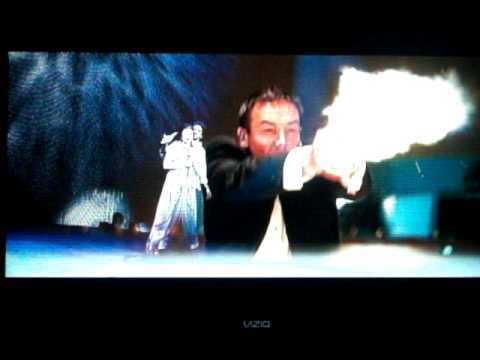 Eliot Carver not die, for a return in Die Another Day or Brosnan his fift. A fift Pierce Brosnan movie in 2005 directed by Michael Apted. Written by Michael France (Goldeneye, Hulk) and P&W. Michael France now did Fantastic Four. If the case, a 6th Brosnan movie in 2007 directed by Mike Newell. Die Another Day March 2003 release date for Uk/VS also. In The Netherlands the movie whas delayd already til 9 January 2003. Brian Helgeland helps to write CR insteed of Paul Haggis and QOS who then be directed by Tony Scott (Scott whas remoured do direct QOS and for DAD there take his Spy Game editor.). I based this on Man On Fire. Another alternate been Frank Oz for DAD, directer of The Score. English. Lee Tamahori directed A Long came a Spider what also be a 2001 movie. Whyle of course Barbara Broccli made very clear she whant Tamahori because of Once Were Warriors. Phillip Noyce also can have done it. (The Bone Collector). Or earlier return of Martin Campbell. Miles Davis doing a score for a b/w Bond directed by Polanski or Truffaut with Jeremy Brett as Bond and Catherine Deneuve. Timothy Dalton should have been the longest serving Bond. He should have taken it after SC. Bond has yet to go out for a curry in Birmingham UK. Ms.Fields not being the new Moneypenny story. Missed opportunities? I'd have liked another Roald Dahl script and perhaps the Burgess script used for TSWLM. And if way out directors are an option the obvious choice would have been Charles Laughton. - Not releasing YOLT before CR67, and avoid the massive drop at the BO. - Not making Diamonds Are Forever the dark revenge flick it should have been after Tracy's death in OHMSS. - GE without Dalton, a real shame. - Not signing James Purefoy (or anyone else half decent) to replace Timothy Dalton and settle for the sub par Brosnan. John Barry not scoring GE..!? Dalton in AVTAK & GE? *edit* @forgotmyusername-- I never even thought of Fields/MoneyPenny! That would have been pretty cool-- if nothing else but to keep Gemma's pretty face around for a few more movies! Good idea! Ah! You just made me remember: Liam Neeson as Bond. Jan Declair in TMND. He did a casting for Gupta. Possible Eon whant him to have some Belgium in the movie because there already have 2 Dutch things and the movie playing in Germany. Gupta can have survived and mabey return with Carver in DAD. Return of Dicky Beer (TMND Stunts) for QOS and Skyfall. Dicky Beer work like Robert Elswit now on The Bourne Legacy. It may very well be on the making of DAF or more likely OHMSS, I seem to recall the same thing as you do. Bean indeed could have been sensational as Bond. True, that! But keeping Serra for one more or hiring someone else from the get go is likely the missed opportunity as there wouldn't have been an Arnold "score". A fellow Brit on this forum thinks Bean would have been terrible as Bond. X3MSonicX At home waiting for Bond 25! it's a Pity Bean can't/couldn't be bond as he was the villain. :/ but i think he could be a great one. QOS for me. It didn't give me the proper closure of bonds relationship with vesper I feel. I would of liked to of seen bond really struggle throughout the film maybe with flashbacks of vesper and I just dont find dominic greene an interesting character at all. The same goes for the whole bolivian water supply plot. I would also of liked bond to kick the hell out of vespers bf , I don't care if vesper or m wouldn't want him to and neither should he! That wouldn't have fit the ending. The whole resolution is Bond seeing that Vesper gave her life to help him and passed on Mr. White's name. Beating/killing Yusef would've tarnished all she meant to him, and after he sees Camille's struggle and has Mathis die in his arms, he says "I don't think the dead care about vengeance". Offing Yusef spat at what Vesper did and what he believed. He is maturing as an agent by QoS's end. The rookie Bond of CR would've killed Yusef in a second, by now we see him making tough decisions dealing with bad men, and he does it justly with his baggage in tow. I know well I'd of at least liked to of heard bonds converstaion with yusef, I felt letdown at the end. How do u feel about QOS? I made it to shine a light on the good things about it, and to give it credit for the great things it did. I hated it the first time I saw it, but since then it has grown on me enormously. I realized that it couldn't and never will be CR, and I'm fine with that. It has flaws, like all the Bond films, but I still think it was entertaining and deep, and worthy of praise. Down the road I can see it getting the kudos it deserves, but popular word that says it's a stinker is still flying around. It is brilliantly filmed, and it is so epic to see Bond coming down the steps after blowing Quantum's meeting only to see Greene and his men just feet away. The music goes silent after the bombastic tone that rings when they see each other, and what follows is one of the greatest scenes of the franchise. I agree with DCisared. QOS didn't take enough time to deal with Bond's struggle. I like your examples of using flashbacks, that would have been a brilliant touch. But I have to disagree on the "kicking the crap out of Yusef". Bond is supposed to have matured by this point and officially be over Vesper. How he came to that maturity though is completely underexplored.